ETERNITY AND EVERLASTINGNESS… without seam, without joining together! – Queen Hatshepsut. Linking the theme of Women in Power from a previous post and the Ancient Inspirations series of quotes, below are excerpts from a speech carved upon stone by Queen Hatshepsut. It is taken from an inscription on the base of the standing obelisk erected by her at the temple of Karnak. As mentioned in the earlier post, in her role as pharaoh in a female form she combined and employed the iconography of both male and female genders. Drawing upon enduring sphinx iconography, here the pharaoh is depicted with unusual rounded ears and ruff that stress the lioness features of the statue, human face and divine/pharaonic beard (Fig. 1). Again in these lines of her speech, are similar joint references. For eternity and everlastingness, They are each of one block of hard granite, without seam, without joining together! While changing cycles were recognized as evident in nature, the Ancient Egyptian worldview and orientation was toward alignment with the enduring and eternal. This ideology permeated their entire culture and is practically manifest in their art, architecture, the symbolic structure of the language itself, and written upon the myriad magnificent monuments they erected. Lichtheim notes that the queen initially erected four obelisks, two of which disappeared and one which had fallen. The standing monument is shown in Fig. 3 at right (Photo Source: Uploaded by user via Holism in Ancient Egypt & Greece on Pinterest). 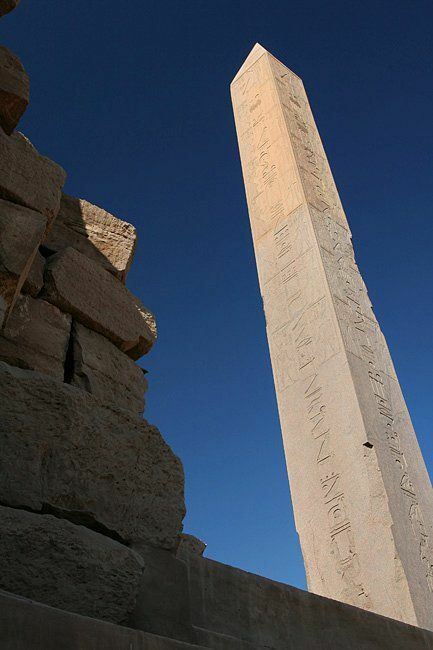 The towers “whose summits would reach the heavens”, were described as made of pink granite from Aswan and adorned with electrum (white gold). The inscription reads “Wrought with fine electrum, they illuminate the Two Lands like Aten [the sun disk]” revealing they would certainly have shone with a brilliance for all to behold!. 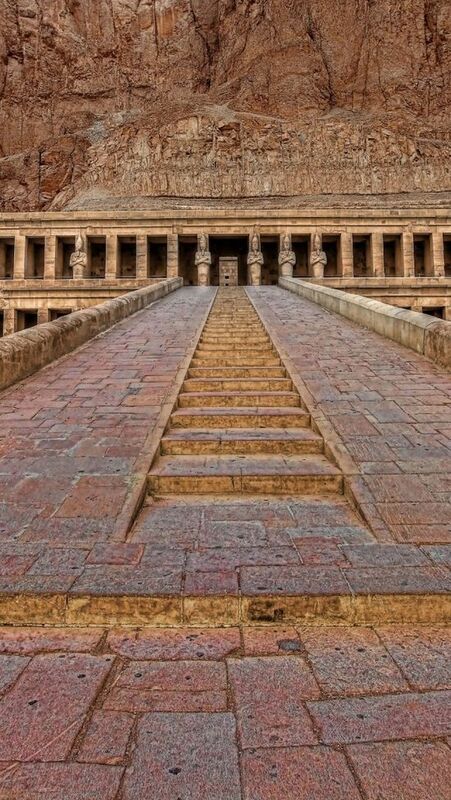 In her ultimate dedication to the Eternal Amun-Re, at Deir el-Bahri, Thebes, shown below is the magnificent funerary/temple complex of Pharaoh, Queen Hatshepsut of the 18th Dynasty. I loved the fact that this unusual image captures the perspective of the dramatic stairway, leading your feet to the upward entrance! For a close up of the pharaoh Hatshepsut in canonical kingly aspect click here. Textual Source of Hatshepsut citations, Lichtheim, Ancient Egyptian Literature, The New Kingdom, bracket inserts mine. This entry was posted in Ancient Egyptian Philosophy, Ancient Inspirations: Reverence for Nature, Egyptian Worldview and tagged ancient egypt, ancient history, ancient inspirations, archaeology, egyptian artifacts, egyptian philosophy, egyptology, history, holistic philosophy, kemet, Queen Hatshepsut, women, Women in Ancient Egypt. Bookmark the permalink. ← Women & Power in Ancient Egypt: After 2,000 years, how far have we really come?